Recently, I shared a post about an infographic I created using Piktochart. The infographic is titled, "6 Tips for Recording Video" and I put it together really as an experiment with Piktochart. Well, today I was on a video call with some of my colleagues at CSU Channel Islands and Michael Berman said, "Hey, Michelle, look what we made!" 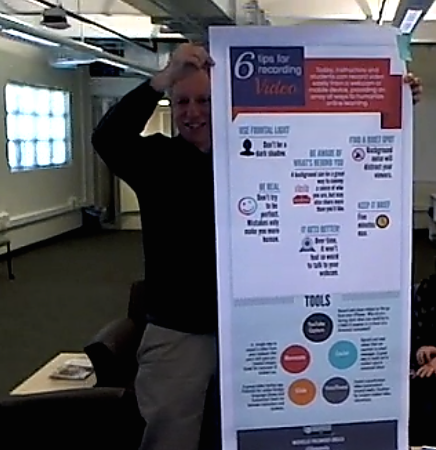 He held up a giant poster of the infographic, which our Teaching and Learning Innovations team will display on the walls in the Faculty Innovations in Teaching (FIT) Studio on campus. What a great idea! The quality looks pretty good too, which was surprising. I just had to share! Below is the embedded version.